If you just started to do this now, the best guide I can find is HERE. However, there are two places that might give you troubles. So when you are following the guide, keep two things in mind. Your screen might seen to freeze with a process ring keeps spinning forever. May be you are thinking “oops, this does not work”. Don’t panic, you have the ubiquitous problem solving tool for Windows–reboot. No, do not reboot your Windows. Just reset the OS X you installed in VirtualBox menu. 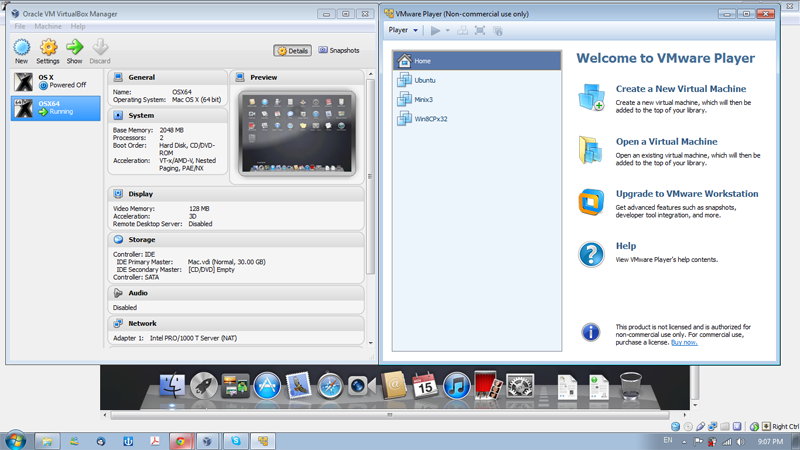 VirtualBox wins VM Player this time. I was not able to install it on VM Player.